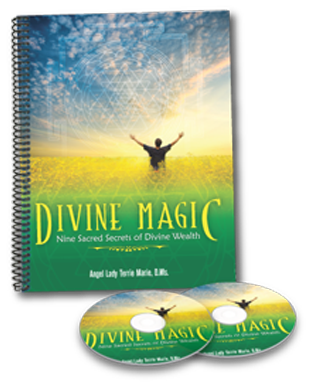 Are looking for ways to … clear negative energy … figure out what your life purpose is … and … finally get why some of your prayers are answered and others seem to be completely ignored? That’s exactly what this book is about and for AND it’s directly from Angels themselves like never before. 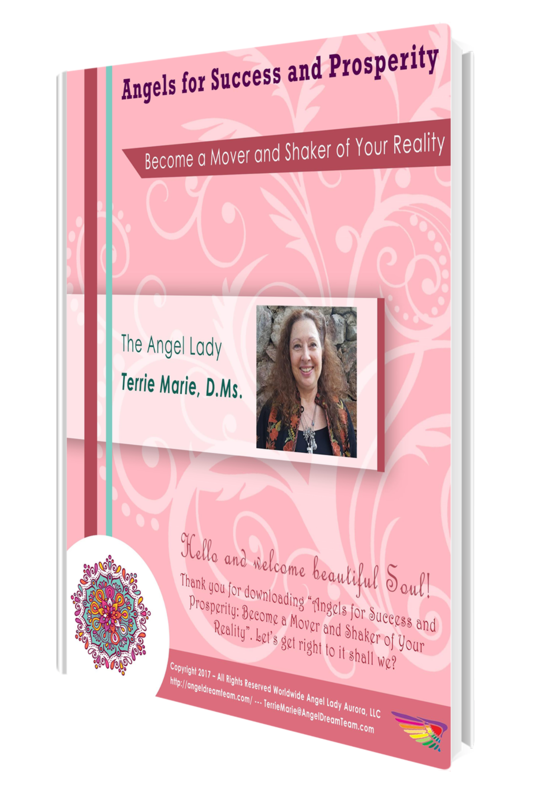 Terrie Marie asks the Angels questions that we all want the answers too and what we can do to help ourselves have more by raising our inner vibration. When it comes to overcoming our fears and challenges, we often rely on material resources that do not offer the desired level of effectiveness for such important matters. Many people believe that there´s some kind of universal procedure to ensure that our goals are met after being set, but they forget that what actually holds power is not in the material plane, but far beyond all time and space. Have you ever wanted to ‘Talk to Angels’ like have a one-on-one conversation with them? That’s exactly what Angel Lady Terrie Marie did … she started asking Angels questions and channeling their answers to share with you, bringing you and the Angels closer together. We’re soooo excite to announce our new book Angels Success and Prosperity: Become a Mover and Shaker of Your Reality. Angels are always by our side, guiding us, clearing our path and nudging us along the right path to fulfilling our purpose. No matter where you are on your journey, Angels have messages to help you find the courage to step out in faith, not by sight …. Physical ‘seeing’ is often mis-leading, distracting you from where you’re going. Why do people hold back? So many Spiritual​ ​Entrepreneurs​ ​are​ ​facing this dilemma as they constantly worry about what others think or say about them, which is something totally irrelevant when it comes to achieving the most loving and powerful realization a person can obtain: Inner Peace. The author believes that in almost every case​ ​these​ ​beautiful​ ​Souls​ ​just​ ​need​ ​reassurance​ ​that they are​ ​not​ ​crazy​ ​for​ ​‘​hearing,​ ​seeing​ ​or​ ​sensing​’​ ​things​ ​differently than​ ​most. It´s a blessing, a gift, a way through that forgotten side of our existence that Modern Age has managed to hide – partially – inside a world of technological advance and virtual connection. “Angels Success and Prosperity: Become a Mover and Shaker of Your Reality” will help you get​ ​your​ ​B.S.​ ​stories​ ​out​ ​of​ ​the​ ​way​ ​so ​you​ ​can​ ​connect​ ​to​ your Inner-Intuitive​ ​Self​ ​and​ ​to​ ​the​ ​Angels,​ ​shaking​ ​up​ ​your​ ​current​ ​reality​ ​for​ ​success​ ​and​ ​prosperity. The Author shines her knowledge with everyone, everywhere so every Spiritual​ ​Entrepreneur can get​ ​out​ ​of​ ​their​ ​own​ ​way​ ​faster​ ​with​ ​less​ ​effort, struggle,​ ​strain​ ​and​ ​everyday​ ​issues​ ​that​ ​distract​ ​them​ ​from​becoming who they really are meant to be. For the next 48 hours only, you can get your copy for $0.99 … this very special introductory pricing absolutely ends at midnight November 25th when the price goes up to $3.99. Please share this with your friends, family and anyone who loves Angels AND wants more success and Prosperity in their life, work and business. Get My Best-Selling Book – Sacred Angel Realms – Free! Instantly Raise Your Inner-Vibration for Outer Success and Financial Prosperity, Better Health, More Wealth and Love! A Completely NEW Way of Connecting to Angels and Universal Energy. This is a limited time offer … Click here to get yours ! Here’s the “story” behind this coloring journal … October 2015, my beloved Angels and I began to bring to form their images for a new set of Angel cards for release in December of this year. It was fun channeling the Angel images and bringing to life with pencil and paper, taking notes of color and how each Angel wants to be represented. That meant going back over all the Angel images that had already been completed — or so I thought lol — and adding details, lots of interesting details AND of course finishing the remaining Angel images. This all started to happened right after the Angel Intuitive Summit I hosted in April of this year. One week later, it was time to start to bring together 13 amazingly powerful Guest Intuitives for our September Angel Intuitive Summit … among other projects, classes and working with amazing clients! Sooooo here it is … Sacred Angel Realms Coloring Journal … Angels are simply amazing. PPS … “I feel privileged to call Terrie Marie not only my mentor, but also my friend. Her energy comes from love and light that she is. She has dedicated her life to be of service, to help people like you and me, to connect with the angels. This wonderful publication “Sacred Angel Realms -Coloring Journal” Invited me to the world of angels and their amazing energies. Just reading about angels fills me up with high vibration, and the coloring part, to me is just to ease up into it, to be one with a particular angel. Feel the love, stress melting away, just being in the moment. A few days ago, July 4th, we published our newest Angel book — Sacred Angel Realms Coloring Journal — maybe you saw it in our Angel Savvy newsletter. It hit Amazon’s Best-Seller list in 6+ hours! How amazing is that? In October 2015, we — my beloved Angels and I — started creating their images for a new deck of Angel cards. Mid-April arrives with new guidance … create a coloring journal. Here we are 2.5 months later and the Angels coloring journal has been published on Amazon! When you are in alignment, things happen with the speed of Angel Wings. “This coloring journal goes so far beyond any other adult coloring book. This is actually a doorway to the angelic realms that provides the means to connect with your angel guides, with their energy, their healing light and to hear their messages meant just for you. As I colored in Terrie Marie’s original drawings I immediately felt the enveloping love of the angel and “saw” the colors to lay down. The angel messages on the page inspired me to go deeper and to receive messages that were meant just for me. The space to write notes on the page allowed me to record my personal message as they were coming through so I didn’t forget anything. Sacred Angel Realms Coloring Journal is the perfect coloring journal for connecting with Angels. Reach into your subconscious mind and manifest through the power of color what you “see” and “feel” when you tap into Angel Energy. PS … “I received one of the First copies available this weekend and I have to say this is one of the most beautiful coloring journals I have ever seen. Not only does it give you a magnificent way of meditating thru creation, but also gives you key elements for your daily enlightenment. You learn to be free of negative thoughts, to release bad energies that otherwise would keep you stuck in a present you do not want nor it is meant to be yours. [3 Mystical Angel Heavens] are you joining us tomorrow? Think of it like being a part of an International Book Club … BUT … instead of being a long-term commitment, it’s a 90-minute intensive with Angels from all 3 Mystical Angel Heavens of Form, Creation and Paradise … touching all 9 Angelic Hierarchies. Angels help you tap into the many gifts they have for you like healing, comfort, hope, encouragement, manifestation, energy clearing, courage, strength, protection and guidance. PS … In 3 Sacred Angel Realms: A Journey “Behind the Angelic Veil” we’ll be exploring 3 Sacred Angel Realms, the Heavens of Form, Creation and Paradise AND 9 Angelic Hierarchies shedding light and giving you insights into the Mystical World of Angels. Click here now and claim your “virtual” seat. Angels of the Heavens of Form, Creation and Paradise are here to help support, guide, heal, comfort, nurture, protect and clear our hearts and pathway to fulfilling our purpose with prosperity and abundance. Angel energy is powerful, all encompassing, unconditional and ours for the receiving. Angels have so many gifts to give you and I’m excited to be sharing so much information about Angels with you so you can have the kind of connection you want to have with Angels. The intention for this online class 3 Sacred Angel Realms is to share the gift of Angels with you because Angels can literally help you transform your lie in ways you can imagine and in ways you cannot yet imagine. You are joining me aren’t you on this journey of going “Behind the Angelic Veil” into all 3 Mystical Angel Heavens and 9 Angelic Hierarchies? Angel of the Presence, Suriel, is an Angel of the Powers and is an Angel of Healing, Time and Transition. Suriel works closely with Raphael for healing on many levels — mentally, emotionally and energetically — helping us recognize what is ours and what truly belongs to others. #1 – The first level of healing is accepting who we are. 3 Sacred Angel Realms: A Journey “Behind the Angelic Veil” into the Heavens of Form, Creation and Paradise starts tomorrow. This online class is being recorded and you will have life-time access to the recording. Can’t wait to “see you in class”! PS … In 3 Sacred Angel Realms: A Journey “Behind the Angelic Veil” w3e’ll be exploring 3 Sacred Angel Realms, the Heavens of Form, Creation and Paradise AND 9 Angelic Hierarchies shedding light and giving you insights into the Mystical World of Angels. Click here now and claim your “virtual” seat.